Why Watch it Today? : Marlene Dietrich was born 113 years ago today. Her role in Touch of Evil barely qualifies as an extended cameo, but contains more memorable moments than most actors get in an entire movie. 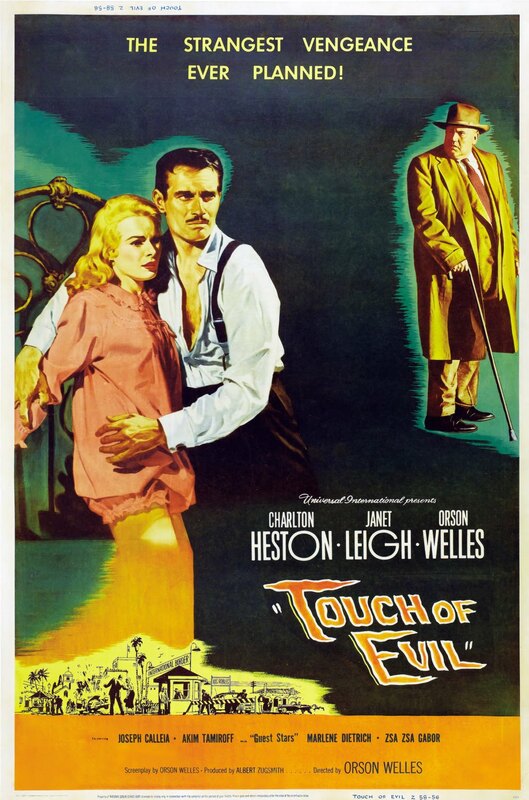 Touch of Evil was writer and director Orson Welles’s last Hollywood picture. It is also one of the few films he directed that exists in a version approximating his intentions, thanks to a memo star Charlton Heston saved in which Welles laid out the elements he wanted restored after major studio cuts. Touch of Evil is one of Welles’ best films, and one of the best Film Noir films. This entry was posted in Adaptation, Based on a Book, Black and White, Cops, Crime, Film Noir, Hostage Situation, Juvenile Delinquent, Movie of the Day, Thriller, Uninvited Guests and tagged Akim Tamiroff, before they were famous, bombing, cameos, Charlton Heston, corrupt cops, corruption, Dennis Weaver, double cross, drug dealers, drugged, drugs, fortune teller, frame up, Henry Mancini, Janet Leigh, Joseph Cotton, Keenan Wynn, kidnapping, low-budget, Marlene Dietrich, Mercedes McCambridge, Mexico, motel, National Film Registry, Orson Welles, Ray Collins, The Border, Universal International Pictures, Zsa Zsa Gabor. While the casting of Heston as a Mexican was just ridiculous, this one’s a true classic. That opening sequence is still amazing after all these decades. Honestly, as bad as it was, the worst thing about that casting is the decision to throw the make-up on him. There were enough European immigrants to Mexico in the 19th and early 20th century that, while it might not be likely, Heston as himself would at least be less weird as Heston with that wear brown face. Anyhow, agree 100%. I guess Deitrich’s performance is why I forget the brown face but it’s right there. I think the brevity of it-and the weird resonance it has-is why I forget.